The creamy mouthfeel and drinkability of cask and nitro beer is being sought out by craft beer fans across the country. The experiences that these beers create are interesting and unique, especially since they’re often only available for a few hours. Their are many similarities and differences between nitro and cask beer, but that’s makes them so intriguing to craft brewers and enthusiasts. For Canter, the nuts and bolts of cask and nitrogenized beers comes down to two things: temperature and stability. For craft beer enthusiasts, homebrewers or beer beginners, the worlds of nitrogenized and cask beer presents many new experiences and opportunities to greater appreciate craft beer. 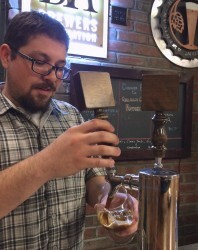 Ben Zeller is a homebrewer, beer and food enthusiast, certified beer server and is the current Craft Beer Program Intern for the Brewers Association. He is also a new father, skier and currently a student at MSUD, anticipating graduation this December. He hopes to learn as much as he can during his time with the BA and continue his career in the craft beer world. The post Nitro Beer vs Cask Beer appeared first on CraftBeer.com.